Keynote address by COAG Advisory Panel on Reducing Violence against Women and their Children Chair, Mr Ken Lay delivered on 25 November 2015. Monash University, Melbourne. ... on this International Day for the Elimination of Violence against Women and Children ... I also acknowledge the many thousands of woman and children who have been murdered, maimed or otherwise harmed by those men who professed to have loved them, it is for them that we do what we do. Articles written by Pam Lacey SI Adelaide and Adelaide White Ribbon Breakfast committee member. Congratulations Arman Abrahimzadeh on being awarded the Allan Sloan Young Citizen Community Service Award for 2015. 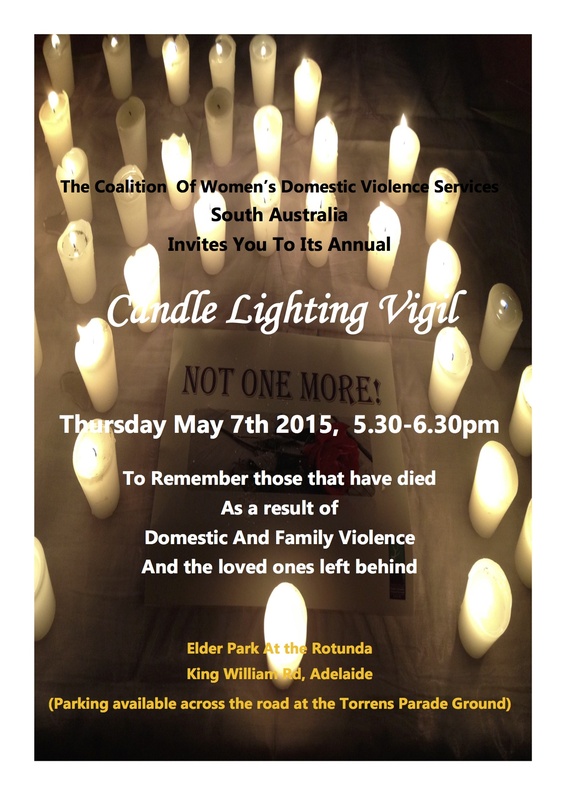 The Candle Light Vigil is an event held by the The Coalition of Women’s Domestic Violence Services of South Australia ( CWDVSSA). A South Australian Peak Body lobbying and advocating for the elimination of violence against women and children, they maintain that all people have an essential human right to respect, safety and self-determination. The vigil is held to remember those who have died as a result of domestic and family violence and the loved ones left behind. Six members from SI Adelaide, withstood the cold weather and joined the Coalition of Women’s Domestic Violence Services again this year, for their second Candle Lighting Vigil. This was held in Elder Park at the Rotunda and about 100 members of the public came along and some politicians. MC for the evening was Amanda Blair. Music was provided by some very talented students from St. Mary’s College, who wrote and performed their songs. A survivor of Domestic Violence, Maria, bravely spoke about her life journey and received warm applause of support from the crowd. Co-Chair of the SA Coalition of DV Services, Vicki Lachlan also spoke and made mention that the “one woman a week” scenario has been exceeded this year, which is very worrying. However, there are some positive legislative changes which give us hope of better support for women and children. Vicki finished her speech saying “We will remember them”. Having lost these precious family and community members must give us motivation to continue our efforts to eliminate violence against women and children and achieve the social change we seek. 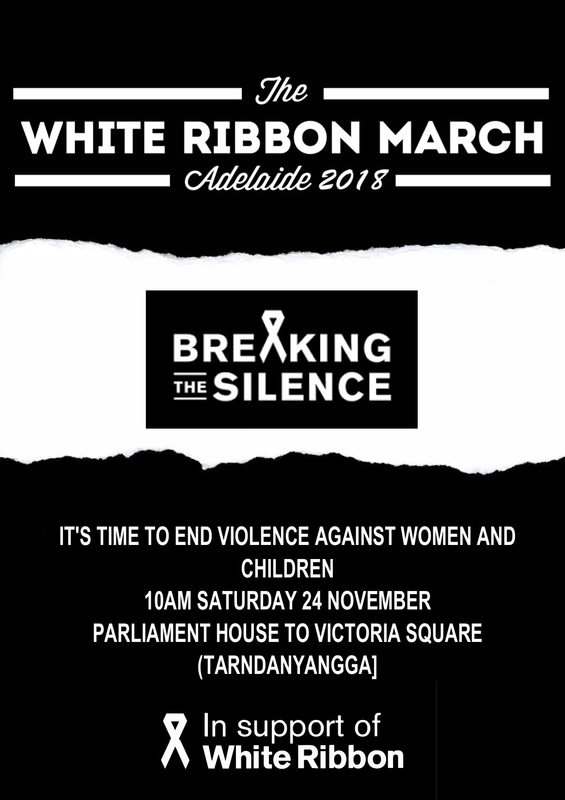 Through our representation on the Adelaide White Ribbon Breakfast Committee we are committed to raising awareness and advocating for an end to violence against women. 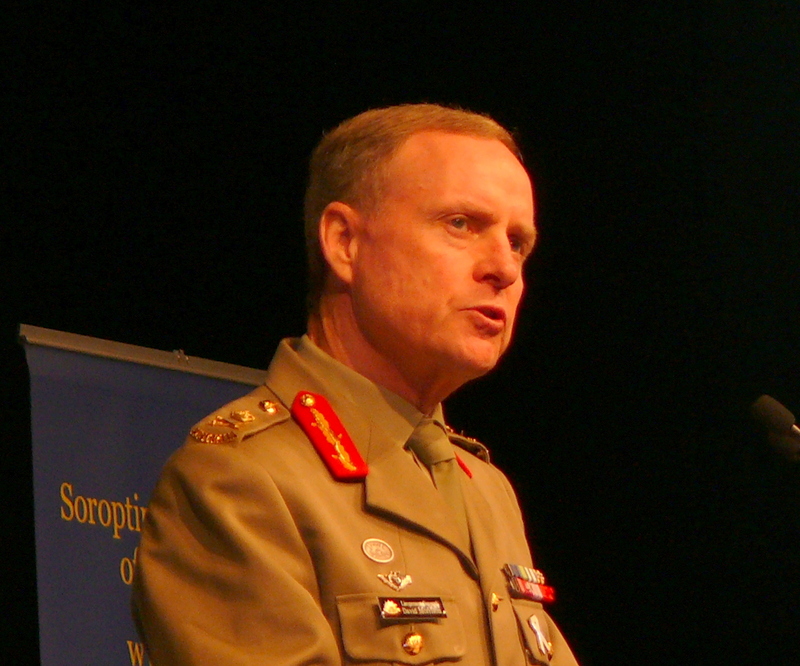 One in three Australian women will experience violence in an intimate relationship. This isn't about strangers. It's deeply personal, and it's happening to people we know and care about. 1) To raise community awareness about domestic violence and its effect on women and children. 2) To assist others to generate awareness of the effects of violence against women and children within their own communities. Soroptimist International of South Australia are proud to support the White Ribbon Breakfast Committee with Soroptimist International member Pam Lacey representing us on the Board. 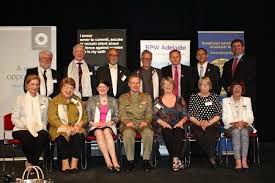 Visit the White Ribbon Breakfast Committee website to find out more about their work and how they may assist your organisastion to make a difference. November 25th White Ribbon day celebrates Australia's only male-led campaign to stop men's violence against women.The seventh annual Adelaide White Ribbon Breakfast was held on the UN International Day for the Elimination of Violence Against Women, by the Adelaide White Ribbon Breakfast Committee in support of White Ribbon. In November last year, at the Adelaide White Ribbon Breakfast, these two men were inducted as White Ribbon ambassadors. I wanted to find out how and why they decided to take up this commitment. They are leaders in the cultural change we are seeking. Many of the ambassadors are older men, so as the Soroptimist International representative on the White Ribbon Breakfast Committee, I wanted to congratulate and support them in their decision to become WR ambassadors. The third young WR ambassador Josh McManus was unavailable as he was off to China. We’ll catch up later. If you are passionate about preventing men’s violence against women and want to join a network of people who are also wanting to make a difference, visit http://www.whiteribbon.org.au/advocates-and-ambassadors. South Adelaide is the leading club in the SANFL acknowledging the issue of Violence against Women in the community. In July 2014 the South Adelaide Football Club held a White Ribbon Round at the Noarlunga Oval. Members of the Adelaide White Ribbon Breakfast Committee distributed ribbons to members of the crowd. Most people wore their ribbon without hesitation. Prior to the commencement of the game, players from both South Adelaide and the Adelaide FC teams stood behind the huge banner and said the WR oath. In 2013 South Adelaide initiated this event, largely due to the persistence of local WR ambassador Tod Stokes.Tod is a committed grass roots local community worker for this cause. During the week, Tod organised for two survivors of DV to speak to South players. Soroptimist Clubs across SA support the White Ribbon Campaign. Visit the White Ribbon website.